Create growth opportunities by turning visitors into customers with EvolveAR. Take the guesswork out of data & analytics with EvolveAR analytics. Engage your audience by instantly publishing to the free EvolveAR app. 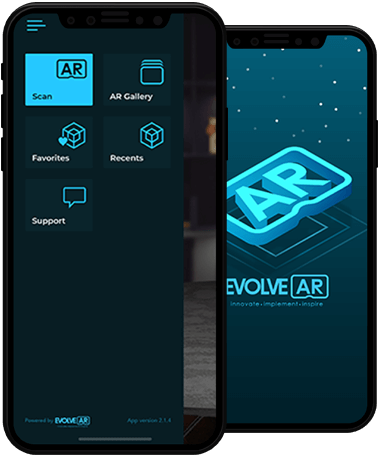 The EvolveAR Scanner provides a seamless connection point between consumers and your AR content. 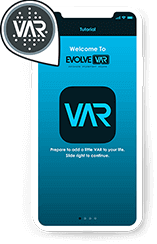 You just have to open the EvolveAR app; scan an image to unlock the magical augmented reality content. With EvolveAR Scanner, the future is in your hands. 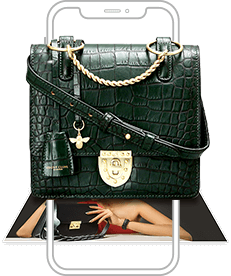 Rapid scanning of objects, magazines, and print media enables your audience to experience immersive Augmented Reality content where fantasy almost becomes reality. discover and share your AR experience with the world. Drive your sales and increase user engagement with augmented reality. EvolveAR’s optimized SDK is easy to install and integrates in a super easy way with EvolveAR Creator. With our custom app solution, you will be able to measure every user interaction, scan and share your EvolveAR campaign. Additionally, our in-house app development team can build a custom scanning app that’s specifically designed for your business. Our 100% white label solutions ensure you have no association with EvolveAR! You can customize anything & everything from the back-end the way you want with a complete control over content. EvolveAR custom AR app also helps in increased customer-engagement. You just have to upload your content and you can have a branded app in minutes resulting in maximum results with minimal work. Whether you need assistance in developing a custom asset or solving a technical query, our personalized AR experts are available 24/7 to help you create an immersive experience for your customers. There’s no programming or coding skills required to use EvolveAR custom app solution. Start building your branded app to market your products and establish a strong foot print foothold in your industry. Scan EvolveAR Powered content to unlock the magic. © 2019 Evolve Innovative Solutions PTE. LTD. All rights reserved.